Can I Buy More Than One Life Insurance Policy? 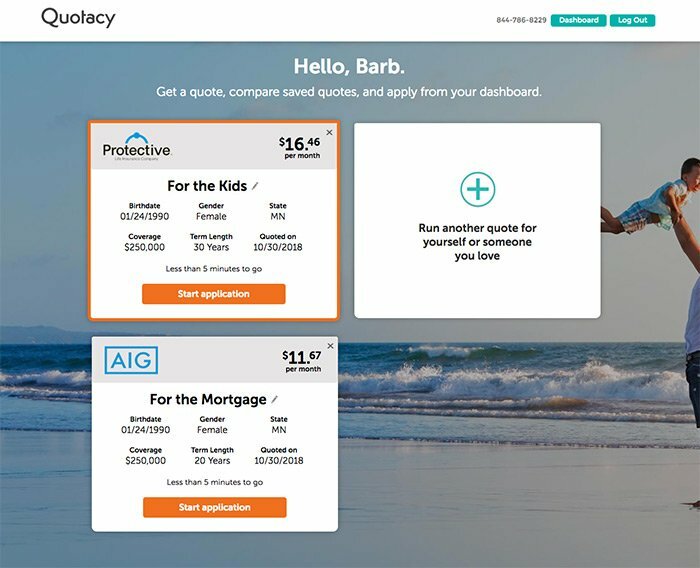 Shopping for the perfect online life insurance policy can be overwhelming, but with Quotacy at your side, it doesn’t have to be. Let us help you consider your options when you need to fill gaps in coverage. Here we highlight when it might be beneficial to purchase multiple life insurance policies online. This is called laddering life insurance policies. It’s common to own different life insurance policies with different term lengths or coverage amounts. Your needs change as life goes on. Most young families have the greatest financial need the first twenty or so years after starting a family. The majority of earned income goes toward a mortgage or rent and raising children. Take a look on the Quotacy Dashboard screenshot below. This is a common scenario. For example, let’s say you just purchased a home and had a baby. Your mortgage is a 30-year term loan and you owe $250,000. You can buy a term life insurance policy to cover this loan and ensure your family can keep living in the home if you died suddenly. Or, if you live a long, happy life, the coverage is designed to drop off once the mortgage loan is paid. Using the Dashboard you can give your policy a name. I just named this one For the Mortgage. You can also purchase a second term life insurance policy to provide support to your partner during the years your children are growing up. Kids are expensive. 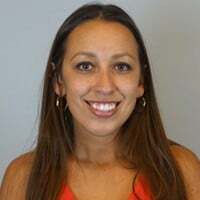 If you died unexpectedly during those first 20 years while your kids aren’t yet quite adults and dependent on you and your spouse, not only would your beneficiaries receive the $250,000 death benefit from your 20-year policy, but they would also receive the additional $250,000 from the 30-year policy. These policies provide support to your loved ones should you pass away during their most financially-vulnerable years. How Much Life Insurance Can I Buy When Laddering Policies? Life insurance companies do not have restrictions when it comes to buying multiple policies—as long as the coverage amounts are justified. The insurance company would be cautious as to why someone with no spouse or children would want to insure themselves with that much coverage. They would be wary of the person’s ability to consistently afford the premiums. There are a lot of costs that go into insuring someone including administrative costs, the medical exam and testing costs, and potentially having to pay out a large death benefit, so life insurance companies weigh all the risks for those who apply for coverage. That being said, if you have the justification and insurable interest for owning multiple life insurance policies, then doing so can be very beneficial. 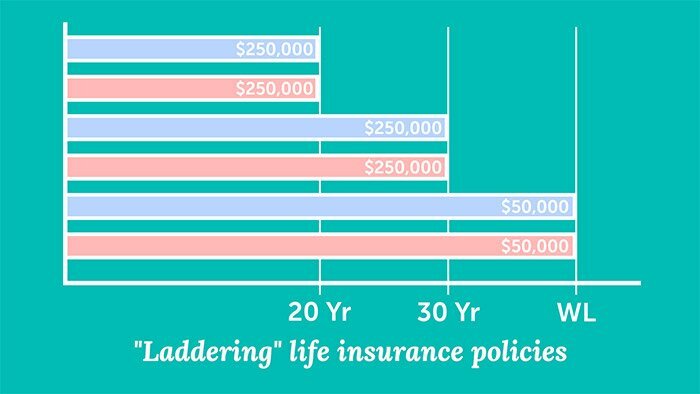 Let’s go over a few scenarios in which laddering life insurance policies may be a good idea. You want life insurance coverage to ensure your children will have money for college, your mortgage will be paid, and to provide income replacement to your spouse in case you die prematurely. Instead of purchasing a single $1,000,000+ dollar life insurance policy, you can layer multiple policies to save money and avoid being over-insured. By layering these policies, for the first 10 years you will have over one million dollars in coverage. Then the amount of coverage (and what you pay in policy premiums) will decrease as your insurance needs decrease. Because your age and health play a significant role in determining your policy premium costs, buying the policies all at once, instead of waiting for when the needs arise, can save you money. The longer you wait, the older you get, and the chances of health issues appearing will increase. You and your spouse work well-paying, steady jobs, have a generous savings and retirement portfolio, and are parents to two young children under the age of 5. You still owe $350,000 on your 20-year mortgage. You know that if one of you died prematurely, the other could afford a nice funeral and pay off any final expenses. You mainly just want to ensure your children get a good education and that your family can continue living in your home. You could purchase a $400,000, 20-year term policy to ensure your mortgage would be taken care of and a second $150,000, 30-year term policy to ensure both of your children are taken care of and can go to college. Once your mortgage is paid off, you could let the $400,000 policy expire leaving you with 10 years left of coverage on an additional policy, just in case. Owning two separate policies instead of one $550,000 policy provides flexibility and affordability. You are a husband, father, and business owner. You plan on retiring in 20 years, you have 15 years left on your mortgage loan, and your children are ages 10 and 15. You could purchase an online life insurance policy—a permanent (whole life) insurance policy. This would ensure your wife would have money in her retirement years to replace social security benefits, cover estate taxes, funeral costs, and any other final expenses. You could add a 20-year term life insurance policy that is structured to fund a buy-sell agreement to protect your business. This would ensure that if you died prematurely the remaining business owners would have the funds to buy your share at a previously agreed upon price; this arrangement allows the surviving owners to keep the business while your family still gets a payout. This business policy would be owned by the business or the other owners of the business. You could also add an additional 15-year term policy to cover the remainder of your mortgage and both of your children’s education. Now, why would you purchase three different policies here instead of just one? With multiple policies in place, once your children are grown and you’re retired, you can let the term policies expire. Rest easy knowing you’re still on this side of the grass and that you have a permanent life policy locked in place to cover final expenses. Owning additional term policies instead of a large permanent life policy for all those years would align better with your needs, be more affordable, and allow for different ownerships. Purchasing multiple life insurance policies with different amounts and term lengths is a great strategy known as laddering. In many cases you can save money by owning multiple life insurance policies, but it’s important to note that each policy has a fixed policy charge. Also, each of your policies would be subjected to the insurance costs associated with policies within that band of coverage. The larger the policy, the lower the costs are per thousand of coverage as they cross those bands. You can have multiple policies from different insurance carriers. Let’s say you purchased a $150,000, 20-year term policy from Insurance Company A before you had children. You now have a baby on the way and want more coverage, but discovered Insurance Company B has better rates. You are free to apply to the second company and still keep your first policy. Life insurance is very flexible and can be structured to fit your individual needs. If you are unsure what your coverage needs are or whether multiple policies would be in your best interest, contact Quotacy to learn how to get an online life insurance policy—whether you need one or multiple term life policies. The answer is yes. You can own multiple life insurance policies as long as the amounts are justified and you do not go over your insurability limit. Your insurability limit is the total amount of coverage you can be insured for across all policies at one time. This limit is usually quite large and most people don’t have any problems keeping under the amount. And it’s actually quite common to own multiple life insurance policies on yourself. This strategy is called laddering and can be helpful in saving you money over the years. Your needs change as life goes on. For example, most young families have the greatest financial need during the first 20 years after starting a family. But after kids are grown and out of the house, your coverage needs diminish. By laddering policies, you can layer multiple policies in such a way that you have varying amounts of life insurance coverage throughout the years, but the coverage overall decreases as your need for it decreases. It ensures you aren’t paying for coverage that you don’t need. Let’s look at an example to help illustrate this strategy. Rhett and Scarlett are married and just purchased a home. They also have two young children, both toddlers. Rhett and Scarlett each purchase a 30-year term life insurance policy with $250,000 in coverage. This ensures that if either of them were to die unexpectedly, the mortgage can be paid off and the family would not have to be uprooted. They also each purchase a 20-year $250,000 term life insurance policy to provide the surviving parent the necessary financial support to raise their children if either Rhett or Scarlett died suddenly before the children were independent. Lastly, Rhett and Scarlett each purchase a small $50,000 whole life insurance policy. This coverage lasts their entire lives and can help cover end-of-life expenses. Now let’s take a look at why this strategy can save Rhett and Scarlett money. Let’s say instead of laddering the previous policies Rhett and Scarlett decided to just each buy a whole life insurance policy to cover all their needs. They each buy a $500,000 whole life policy that will provide funds to cover the mortgage, raise their children, and help with final expenses—no matter when they die. 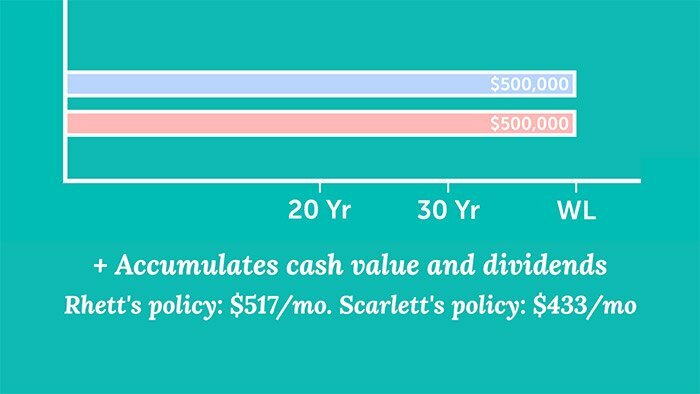 These policies do accumulate cash value and can provide dividends, but on a monthly basis, a $500,000 whole life insurance policy will cost Rhett about $517 per month and Scarlett $433 per month. Or let’s say Rhett and Scarlett decide to each buy a $500,000 30-year term policy to cover all their needs instead of two $250,000 policies with different term lengths. 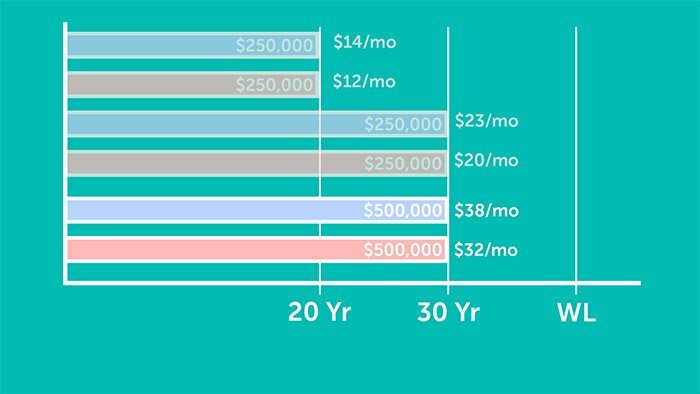 With the laddering strategy, Rhett is paying a total of $37 per month for both policies for the first 20 years until the first policy ends. Then he only pays $23 per month for the remaining 10 years of his 30-year term policy. And you can see Scarlett pays even less. If Rhett instead purchased the one 30-year policy with a face amount of $500,000, Rhett would pay $38 per month all 30 years. Over the long run, if Rhett outlives his policies, with this ladder strategy he would save himself $2,040. And Scarlett saves herself $1,440. The laddering strategy can save you some money while simultaneously making sure all your needs are covered through the years. Most families do not need $500,000 in permanent life insurance, and a household spending nearly $1000 each month on life insurance coverage could spell financial disaster for most realistic budgets. However, laddering term life insurance coverage with a small whole life policy can be very beneficial. And not all families even need whole life insurance coverage at all; oftentimes term life insurance in addition to your everyday savings and emergency fund can provide the right amount of financial protection. In many cases you can save money by owning multiple life insurance policies, but it’s important to note that each policy has a fixed policy charge. So by owning more than one, you would be paying more than one annual policy fee. However, all the quotes we showed in the previous examples did include these charges, and our fictional friends still saved money. If you’re unsure what type of life insurance you need, how much to buy, or if laddering is a smart strategy for you, we can help you figure it out. If you have any questions about life insurance, make sure to leave us a comment. Otherwise, tune in next week when we talk about when you should review your life insurance policy. Bye! Is the any personal risk to the employee if a company want to take a COLI policy out on them? Would rates be higher or coverage offered be lowered by this? When a company takes out corporate owned life insurance (COLI) on their executives or even all employees, there isn’t an impact to the insurability for the employees. Any coverage the company owns is viewed as business coverage and doesn’t impact the amount of insurance the employee can receive personally. Rates won’t be impacted for a personal policy either. Life insurance rates are determined from many criteria (including age, gender, smoking status, lifestyle, health, etc.) Rates are not determined based on whether or not a business owns insurance on the employee, and the amount of personal coverage is not impacted either. There be to separate checks issued to the beneficiaries? Because the two different policies have two different policy numbers, it’s likely that the insurance company will send out two separate checks. Purchasing multiple life insurance policies is a great strategy. It allows you to start where you can afford to start and to increase your total coverage over time. Don’t get stuck in a procrastination waiting for the perfect policy. Start with something and add more later. Great article.